Available Colors: Red, Blue, Silver, Green or Black. Shipping Weight: Gift Box, 240 per carton @ 40 lbs. 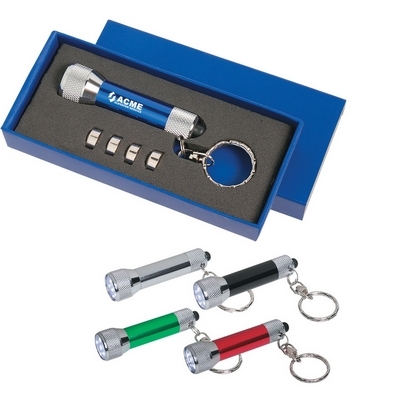 Customized Aluminum Flashlight Key Chain Item #HT-2505 (Minimum Order: 100). Promotional Flashlights like the Aluminum Flashlight Key Chain can be personalized with your business logo and with No Setup Fees. 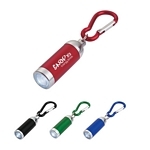 Customized Mini Aluminum Led Light With Matching Carabiner (Item #HT-2506) is Promotional with a Free Artwork Imprint. Promotional Carabiners are decorated with your logo with no setup fees. Customized Aluminum Led Flashlight With Strap (Item #HT-2509) is Promotional with a Free Artwork Imprint. Promotional LED Flashlights like our Personalized Aluminum Led Flashlight With Strap are decorated with your logo with no setup fees. 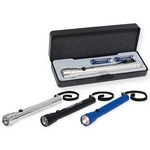 Customized Small Aluminum Flashlight with Strap Item #HT-2510 (Minimum Order: 100). Promotional Flashlights like the Small Aluminum Flashlight with Strap can be personalized with your business logo and with No Setup Fees. Customized Large Aluminum Flashlight Item #HT-2511 (Minimum Order: 100). 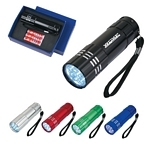 Promotional Flashlights like the Large Aluminum Flashlight can be personalized with your business logo and with No Setup Fees.